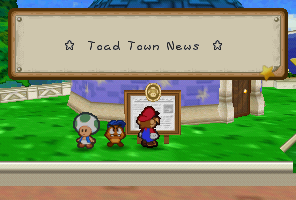 This is a list of the news and the scribbles on the notice board near Merlon's house in Toad Town in Paper Mario. The messages written on the front of the sign are on the left column of the table below, while the messages written on the back are on the right column. Princess Peach Kidnapped!! Castle Uprooted!! A few days ago, Princess Peach's Castle was stolen. She was inside and is presumed kidnapped. The whereabouts of the princess are unknown, and where the castle once stood there is now a gaping hole in the ground. According to witnesses, the castle rose into the sky. As soon as we get new information, we'll post follow-up reports on this board. I'm scribbling on the back of the Notice Board. How naughty! Did you hear the gossip about Princess Peach? The Explorer Kolorado Challenges the Mystery of the Desert! Mr. Kolorado of Koopa Village, an explorer and archaeologist, has just started his search for the legendary ruins rumored to lie beneath Dry Dry Desert. As of this writing, he has yet to come across a single clue. Morale, however, remains high! Koopa Koot of Koopa Village is trying to recruit people to do him favors. Word is, if you grant his requests, he rewards you. He's a pretty self-centered old Koopa, though, so who knows if anyone will be willing to help him. If you're reading this and have a kind heart, why don't you do an old Koopa a favor? Mario More than a Match for the Koopa Bros. Fortress! Our hero, Mario, has vanquished the Koopa Bros. who lived in the great fortress to the east. The Koopa Bros., longtime underlings of Bowser, had been left to guard one of the kidnapped Star Spirits. That Star Spirit has returned to Star Haven, all thanks to our hero. The train parked at the station at the south of town is pretty spiffy, isn't it? It's called K64. Unfortunately, a huge boulder has fallen on the track and the train can't go anywhere. Talk about a crying shame! Dry Dry Railroad's Grand Reopening! The massive boulder problem plaguing Dry Dry Railroad has finally been solved. The tracks are as clear as the desert sky! If you plan to visit Mt. Rugged or Dry Dry Desert, climb aboard the luxurious, convenient Dry Dry Railroad! If you listen to the radio, you have a chance to win some fabulous prizes! You have three chances to win! C'mon! Tune in to the radio or these prizes'll tune you out! Listen to the Radio Information channel for more details. I heard from this friend of mine whose sister heard Peach likes ♥♥♥♥ ★★★★. Anyway, my cousin ××× said that ○○○ told her ♥♥ said it's true. You think it is? Our resident archaeologist, the esteemed Mr. Kolorado, has finally discovered the legendary Dry Dry Ruins. Although it could not be confirmed at press time, Mario may have played a key role. Details are sketchy, but if the early reports are true, a Star Spirit languishing in the ruins has been rescued. Let's hear it for Mario! Miss T. is very sad to make this announcement. Her beauty has faded because of her sadness. You'd better not eat dishes cooked by Miss T. or you might just turn pale. The rash of ghost sightings in the area seemed to be reaching epidemic proportions. Lately, though, we've seen a marked decrease. And now, we likely know why. The Forever Forest path guard tells us that Mario has entered the forest. As soon as we can, TTN will interview Mario to get a first-hand report on this bold move. Stay tuned to this board for our follow-up to this breaking news. So sleepy... Please... Don't make me work so hard. The annual Cooking Contest sponsored by Princess Peach has been postponed indefinitely. Besides sponsoring the annual affair, Peach also hosted the culinary contest at her castle. The disappearance of the castle itself presents some perplexing problems for the contest planners. To those who are pulling their hair out in frustration, we say: Keep the faith, champion chefs! Mario will save the day! You read this underground newsboard a lot, don't you? You must have a lot of free time, huh? Shy Guy Invasion! Robbing Rogues Run Roughshod! A squad of scurrilous Shy Guys has beset Toad Town, leaving our fair citizens in a daze. The thefts are too numerous to name here, but suffice it to say residents are urged to guard their possessions. It's still unclear where the Shy Guys are hiding out. We'll post news as it breaks. How many Koopa Troopas have been beaten up by Mario? It seems that a single Boo was responsible for all of the sightings in town. This Boo was merely looking for a brave soul to help vanquish a Boo-eating monster. Mario, of course, took the challenge and punished the great beast, freeing another Star Spirit in the process. Afterlife has returned to normal for the Boos, so the town hauntings should cease. Next week's editorial: Why Mario is The Man! Scribbling here is so fun! Shy Guys Still Stealing Toad Town in Trouble! Look around, folks! Shy Guys still run rampant in our town. Miss Tayce T., our resident master chef, recently lost a vital frying pan to the pests. These scoundrels came upon Minh T. in her flower garden and gave her quite a fright. By the main gate, they drove a well-meaning shopkeeper from his very own store. They've even been seen bouncing on the bed in Toad's House. Reports are pouring in from all over town about these miniature menaces. They're everywhere! Please take care, folks! To tell you the truth, I'm crazy about Miss Bow. She's so arrogant...so very headstrong... I love it! I can't believe I'm writing this... If Miss Bow sees this, what'll I do? Toad Town Tours are planning many types of trips for your holidays this year. There's a Pleasant Path and Fortress Tour, an Exploration Tour of Dry Dry Ruins, a Cruise Tour in the South Sea by luxury liner, and a full selection of Winter Sports Tours in the Shiver region. We have a tour to fit every preference, and our reservation agents are standing by. For further information, please come by our office or request a brochure. Thank you. I hate fighting Mario! I won't do it anymore! Somehow he always gets the best of us in the end. The once dormant volcano in the South Sea has officially been classified as active. As molten lava can be lethal, travel there is now forbidden. Say hello to Spike! I'm gonna be big in this town! Don't listen to this idiot! This is my turf! The little larceny-lovers known as Shy Guys have finally quit terrorizing the town. Mario tracked them to their Toy Box hideout, valiantly dispersed their ranks, and managed to rescue an imprisoned Star Spirit. To those who would prey on the innocent and weak, we say this: Mario will prevail! I've come back! I'm sure you missed me! I've got a foolproof plan for coins. See you on the road! The small island that appeared recently in the harbor has turned out to be an ailing whale from the deeps. Apparently the whale was floating there, trying to quell a stomachache caused by a hairy caterpillar it swallowed. Mario saved the caterpillar, which had been used as bait by a fisherman. Both whale and caterpillar felt lots better. All's "whale" that ends "whale"! We'll send you beautiful photos of Princess Peach. We will accept no complaints or returned goods. Take one look in front of the Post Office or in the garden of Minh T. and you'll see that Flower Days are here. Let's make this town bloom! Grow flowers in your home garden or plant a few in the town flower garden! I sneaked into Bowser's Castle, pretending to be one of his underlings. Braving the dark, I managed to avoid Koopatrols and Hammer Bros. It wasn't easy to climb up the castle, but spying was a piece of cake. Anyway, I thought the castle was quite well decorated. Isn't it supposed to be gross? Pleasant Path to Become a Toll Road?! An enormous Koopa Troopa has parked himself on Pleasant Path between Koopa Village and Toad Town. The huge creature, who is apparently calling himself Kent C. Koopa, demands coins from every passing traveler. If the traveler refuses, this brute blocks the way with his enormous body. We must stop this extortion as soon as possible! Any ideas would be welcome... For now, we would suggest that you take some coins with you when you go to Koopa Village. I bought Princess Peach's photos by mail order, but they were a total rip-off! I paid 100 coins, but I got only three photos, all of which were horribly out of focus! They sure as Sushie weren't beautiful! Give me back my coins, you swindler! Behind an unremarkable door that appeared in the center of Minh T.'s flower garden, a flower world seems to exist. Toad Town officials are considering a scouting team but there's probably no point, as Mario has already stepped through. We await word from him. Where did the door come from? And why? And how? Flowers can speak, you know. I heard Mario talking with them. Then he went through a magical door to their land. A little while ago we reported on new volcanic activity erupting on an island in the South Sea. Mt. Lavalava on Lavalava Island was the volcano in question. We recently received a report from Kolorado, the famed archaeologist who journeyed into the volcano with Mario. He states that Bowser's minions were behind the seismic tremors that caused the volcano to violently erupt. At great risk to life and limb, Mario made a daring rescue of the Star Spirit that was held in the fiery depths. Mr. Nash T. and his gang rule the streets... Nobody is safe from us, NOBODY!!!! A world populated by flowers lies on the other side of the mysterious door in Minh T.'s flower garden. It should come as no surprise to learn that Bowser's goons were causing trouble there. But guess what? Our own Mario did a little extermination of the pests in that garden! By kicking Bowser's underlings out of the world, he also saved another Star Spirit! Now that's flower power! ××× and ○○○ are ♥♥♥♥.
! !Breaking News!! Peach's Castle Spotted?! On fine days, some keen-eyed observers have reported seeing a tiny black dot way up in the sky. It is only a faint shadow, but even that is enough to fill the people of our fair town with hope. Although the shape is fuzzy, popular opinion holds that it is Bowser's and Peach's Castles, linked together. Perhaps there is hope after all! Princess Peach! Come home! Safety Week Let's Prevent Accidents! As the inside of pipes may be dangerous, do not let children enter them. You never know what sort of creatures might hide within. Even adults should think twice before exploring. Both the people who read and write these messages must have nothing to do but gossip. Of course, I'm one of 'em. Mario went to the Shiver region to look for the last Star Spirit and discovered the legendary Crystal Palace at the top of Shiver Mountain. This Palace is said to have been built and dedicated to the Star Spirits. Bowser's evil followers, however, had taken it over. Mario put those goons on ice and saved the the last Star Spirit! Now, with all of the Star Spirits together, they're on their way to Shooting Star Summit. It's finally time to head for Bowser's Castle! Good luck, Mario!! Now that Mario has found a way into Bowser's Castle, local folks cannot help but expect that our princess and her castle will soon return. Several shops even appear to be planning "Welcome Home" sales for the return. Everywhere you look, hope shines in people's eyes. Will our fair town return to normal soon? Lord Bowser, We were beaten... Don't get mad, please. Just like we knew he would, Mario defeated Bowser and rescued our dear princess. Bowser was badly beaten and will likely never return. We're sure of it. Almost positive. Peach's Castle has been perfectly restored to its original position, and it even sports fresh paint! A grand party celebrating the victory is planned at the castle, with everyone who's anyone in attendance. Hooray for Mario! Hooray for our hero!! From all the reporters, with many thanks! We owe you one, Mario!! Hurrah for Princess Peach! Hurrah for Mario!! Mario was as strong as legend said he was! He fought beside Goombario, Kooper, Parakarry, Bombette, Lady Boo,[sic] Watt, Lakilester and Sushie! We're gonna party like there's no tomorrow! Come on! "Princess Peach may seem quiet, but I heard she has a [crush] on [Mario]! Whenever she's [kidnapped] by Bowser, I bet she wants [Mario] to [rescue] her!" ↑ "Mario in Japan: Paper Mario". The Mushroom Kingdom. Retrieved on August 5, 2014. This page was last edited on November 11, 2018, at 20:39.